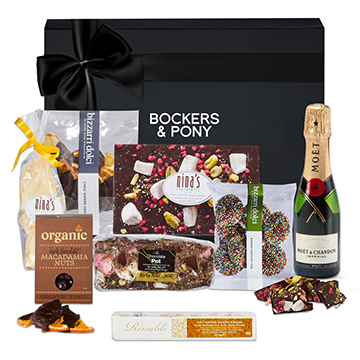 Welcome to Bockers & Pony, home of the most luxurious Hobart gift hampers imaginable. We're delighted to bring you Australia's finest collection of unique gift ideas, designed and curated to bring joy to sender and receiver alike. Each stunning gift hamper showcases a selection of elegant, hard-to-find products, handpicked by our team to give your recipient an experience like no other. So, get comfy and enjoy shopping our exclusive range of gift hampers Hobart. Then, relax as our superb Hobart hamper delivery team transports your generosity to your deserving family and friends. 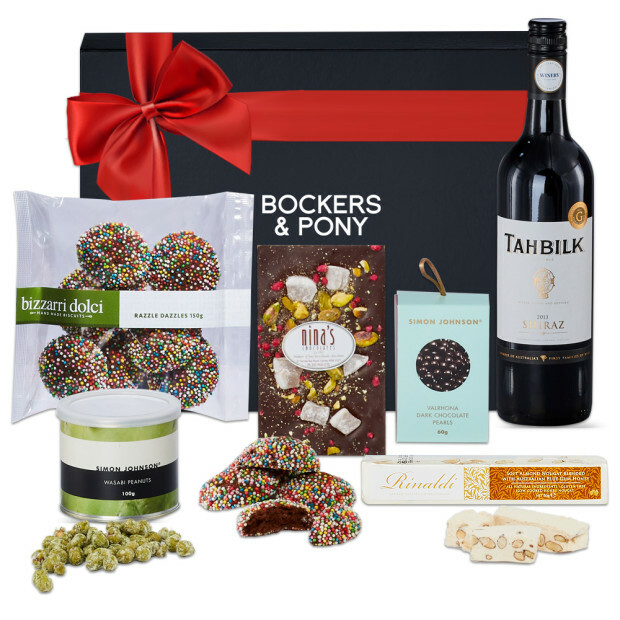 From big events to little acknowledgements, we make it easy for you to browse and buy Hobart gift hampers online. 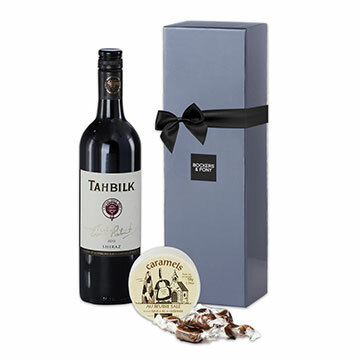 With the most comprehensive collection available in Australia, you'll find elegantly different gift ideas for every occasion to help thank, congratulate, celebrate a birthday and anniversary or wish someone better with a healthy get-well gift. Regardless of the occasion, our Hobart hamper delivery experts are on hand to surprise and delight with free standard delivery and next business day delivery services for Hobart city addresses. What's In Our Luxurious Hobart Gift Hampers? 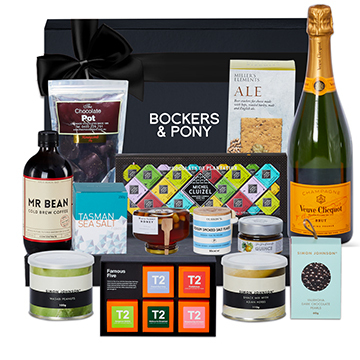 We design and curate every Hobart gift hamper to make your recipient feel truly cherished. That's why our unique hamper ideas showcase gorgeous products that are hard to find in the shops. 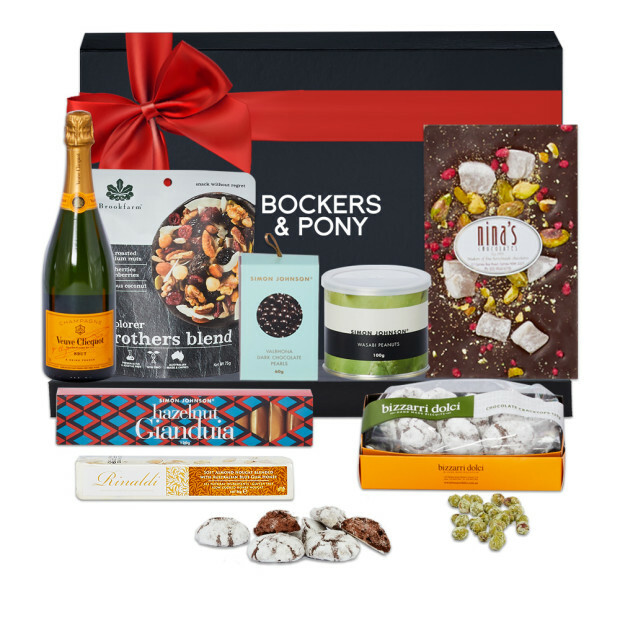 To us, the hamper experience should treat all the senses, so we include sumptuous packaging, the tastiest gourmet goodies, the finest wines and champagnes and amazing pampering products made exclusively for Bockers & Pony by leading artisan brands. Celebrate A New Arrival With Our Hobart Baby Gift Hampers! 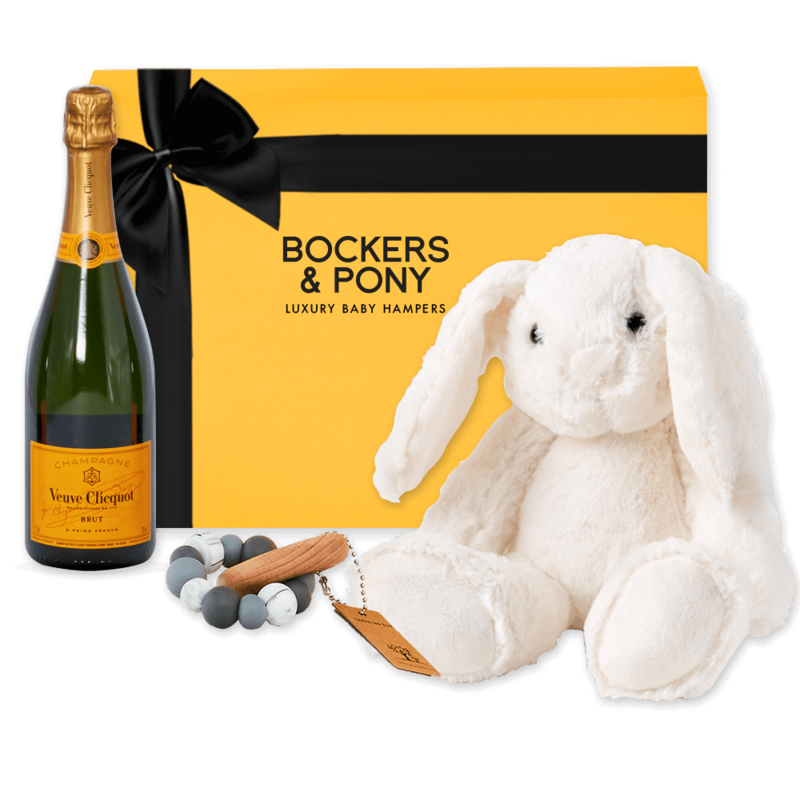 Since our launch more than a decade ago, Bockers & Pony has grown to become the leading provider of high-end gifts for baby boys and baby girls. 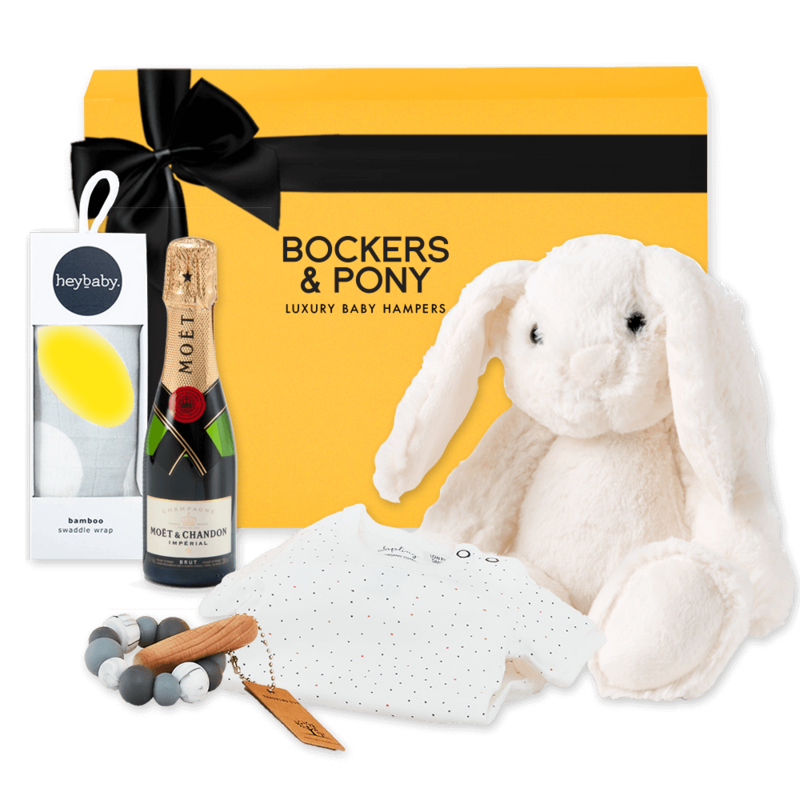 Our online shop features a stunning collection of Hobart baby gift hampers to suit every budget and taste. From furry bunny and sheepskin bear friends to the softest wool blankets and elegant yet practical clothing — these heavenly Hobart gift hampers will be adored by parents and baby alike. A handy tip — if the new mum is in the maternity ward, we like to give our Hobart hamper delivery team her maiden name in case the nurses have used this when checking her in. 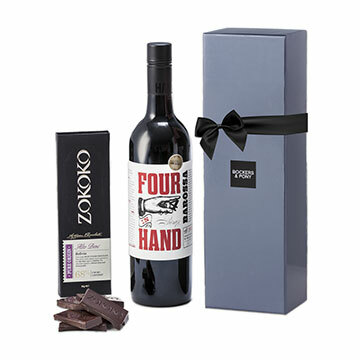 We're renowned for the immaculate presentation of our luxurious Hobart corporate gift hampers. 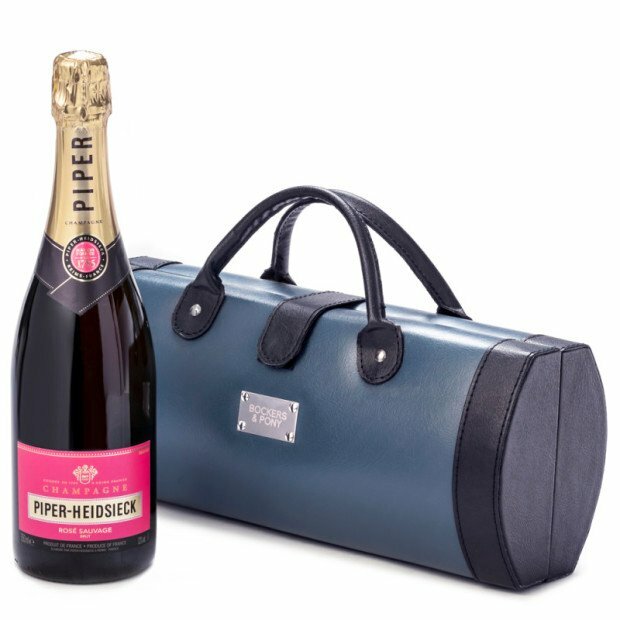 Whether they arrive in a suitcase, gift box or wine carrier, there's generous space to add your logo or message. 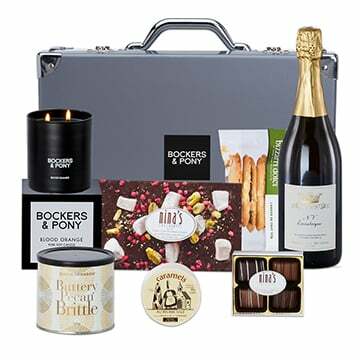 Fully customisable, our phenomenal range of stylish and covetable Hobart corporate gift hampers showcase exclusive luxury contents and exquisite presentation so that your business stands apart. Whether you're ordering one or hundreds, get in touch with our team on 1300 132 663 or email [email protected], and they'll look after you and all your Hobart and Australia wide hamper deliveries. Imagine a Christmas where you don't need to park or queue. 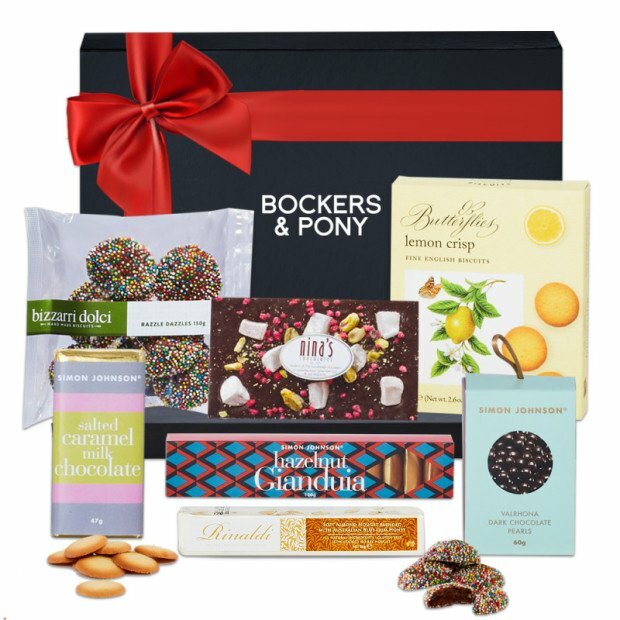 Thanks to our amazing range, we've got Christmas covered with unique Hobart gift hamper ideas to make their Christmas special. With all the hard work done, you can relax, safe in the knowledge that your exquisitely presented hamper will arrive with a personalised card courtesy of our fantastic Hobart hamper delivery team. Of course, it gets a little busy during the Christmas period, so we recommend you allow an extra day for your Hobart gift hamper to arrive! 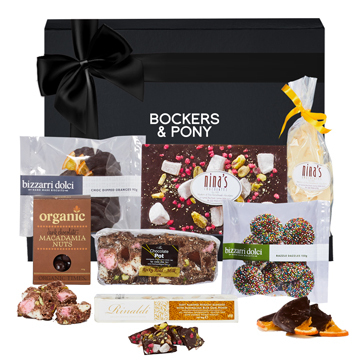 Bockers & Pony was founded in Melbourne in 2004 to bring back the joy of giving with gift hampers that reflect how you feel about your recipient. 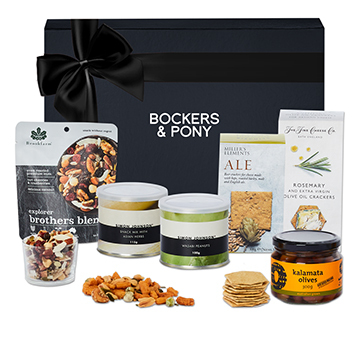 Today, Bockers & Pony has grown to become Australia's leading gift hamper destination for those seeking immaculately presented gift hampers with exclusive product combinations. So when it comes to surprising and delighting with a Hobart gift hamper, you can trust us to help you make their day special. 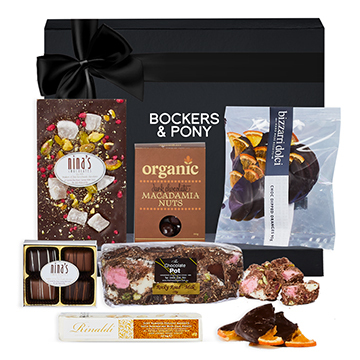 We deliver our Hobart gift hampers to Metropolitan city areas and Hobart regions from Monday to Friday. We don't deliver on Saturdays, Sundays or public holidays, so please bear this in mind when placing your order for Hobart hamper deliveries. The price for delivering one hamper to a Hobart address is $16.95, including GST. Additional charges apply for multiple deliveries to the same address or different addresses. 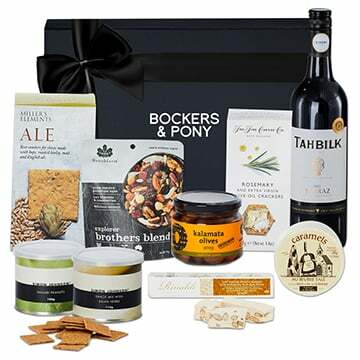 Hobart gift hamper deliveries to PO Box addresses, parcel lockers and RMBs (registered mail bags) cost $25.95, including GST. If you would like us to deliver multiple hampers to different Hobart addresses or Australia wide — email or call us on 1300 132 663 so we can give your order some extra special attention. Order before 3.00pm, and we'll deliver your hamper to a Hobart city address the next business day. The same applies to all capital cities if you're sending a hamper interstate. If you're sending your Hobart gift hamper to regional, remote or rural locations, please allow two days. You can choose your preferred Hobart hamper delivery date at the time of order when prompted during the checkout process. Three Brilliant Hobart Hamper Delivery Tips! We authorise our courier to leave your Hobart gift delivery if the recipient is not at home and they deem it safe to do so. If it's not safe, or if you have organised for your Hobart hamper delivery to a PO Box address, they'll leave a calling card, and your recipient can collect the hamper from their local post office. Our Hobart gift hampers make the most thoughtful gifts for people in hospital. Just make sure you provide the patient's home address too as we find doctors discharge people quickly. That way, our Hobart hamper delivery team can track them down at their home. 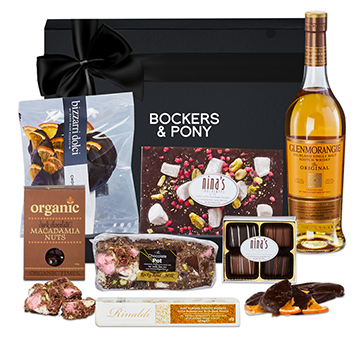 We always want you to have the best Bockers & Pony experience, so we endeavour to make sure your Hobart gift hamper arrives as close as possible to your preferred date. If we do not deliver your gift on your preferred date, we are unable to cancel your order or credit your transaction. 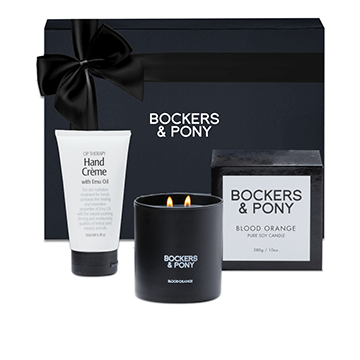 Our wonderful Bockers & Pony team is here to look after you and help you make someone's day special. Please do call us on 1300 132 663 or email [email protected] if you need assistance ordering or have any questions regarding your Hobart gift hampers.